With these powerful words, the President of the International Federation of Red Cross and Red Crescent Societies, Mr. Tadateru Konoé, closed his State of the Federation speech to the General Assembly, reminding delegates that our daily responsibility is to respect and uphold our Fundamental Principles. Mr. Konoé mentioned some of the challenges we are facing, including the challenge of recruiting and retaining volunteers, and also talked about the fast-paced and dramatic changes in the humanitarian environment. He sees these changes as opportunities, as National Red Cross and Red Crescent Societies are uniquely placed to respond to these challenges. “No other actor has our reach, our community-level capacity backed by our international resources and solidarity,” he said. As Mr. Konoé said, we are stronger when we work together as a Movement. When a major disaster strikes, there is usually a limit to how much a single National Society can respond. It is during these times that other members of the International Federation also mobilize. The President also remarked that a series of processes designed to improve collaboration within the Movement will be discussed during the Council of Delegates. With the reminder that the 100th anniversary of the International Federation of Red Cross and Red Crescent Societies is very near, Robert Tickner, Undersecretary General for Partnerships a.i. at the International Federation, formally welcomed delegates to the 20th General Assembly. He encouraged all National Societies to use this anniversary as a symbol to truly transform the IFRC. After a few inspiring words he introduced a diverse chorus of musicians and singers – Syrian refugees, volunteers, and professional musicians. The chorus played three pieces, closing their performance with “Ode to Joy”. After the performance, IFRC President Tadateru Konoé took the floor and welcomed all delegations present in the plenary. He mentioned the important role they play as the IFRC, inspiring people and speaking on behalf of those in need. He also asked delegates to remember the Red Cross and Red Crescent volunteers and staff who have died in the course of their humanitarian duties, and called for a minute’s silence in their honour. Mr. Tickner thanked President Konoé for his speech, and introduced the new International Federation corporate video, which “shows all the range of assistance that the Federation is providing today, from emergency response to the strengthening of resilience”. He asked delegates to take all the opportunities offered by the General Assembly to enjoy the meeting, renew old friendships and make new ones, and “let the power of humanity inspire you”. The Tuvalu Red Cross has become the 190th member of the International Federation of Red Cross and Red Crescent Societies. 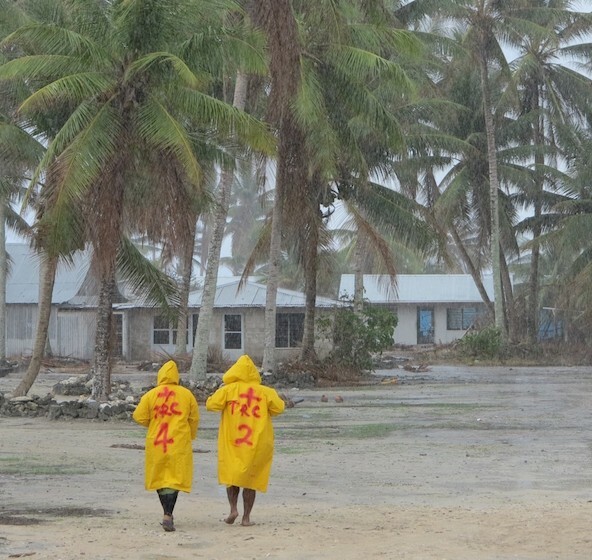 In March, volunteers were in action in the wake of Tropical Cyclone Pam. Today, at the 20th General Assembly, the Tuvalu Red Cross Society was officially admitted as a member of the International Federation of Red Cross and Red Crescent Societies. It is the 190th National Society to be formally recognized by all components of the International Red Cross and Red Crescent Movement. The Tuvalu Red Cross has been an important provider of local services since 1965, when it was founded as a branch of the British Red Cross. In 1981, three years after Tuvalu gained its independence from the United Kingdom, the Tuvalu Red Cross adopted its own constitution. With branches on all eight populated islands in the nine-island group — and around 800 members, 600 of whom are volunteers — the National Society is legally recognized by the Government of Tuvalu as auxiliary to the public authorities in the humanitarian field. The new status will help the National Society’s work with its Government and international partners on disaster preparedness and response, and also boosts the organization’s efforts to advocate for change on pressing issues such as climate change. “You cannot talk about volunteerism without being emotional,” said Emmanuel Hindovei-Tommy, Secretary General of the Sierra Leone Red Cross Society, in trying to explain to his audience the motivation of his volunteers to continue giving of themselves during the largest Ebola outbreak the world had ever seen. At a side event on “Investing in Africa…volunteering a way of life”, National Societies examined the trends, challenges and opportunities for volunteering in the context of Africa. They shared examples of good practices, such as the ability of the Burundi Red Cross Society to increase its volunteer base from a handful to more than 300,000 over the span of five short years. “The starting point of developing volunteering in our communities is our seven Fundamental Principles,” said Anselme Katiyunguruza, Secretary General, Burundi Red Cross Society. “Do we all have the courage that we need in order to live up to the Fundamental Principles?” he further challenged the audience consisting largely of peers from fellow African National Societies. Does your National Society have a webpage or Facebook profile but is still struggling to fundraise online? It’s easier than you think: with the Red Cross and Red Crescent online donation platform you can join global campaigns, display your National Society logo and receive all funds raised in your country as well as donor data. Since 2011, the International Federation of Red Cross and Red Crescent Societies and the Swiss Red Cross have been working with ammado, an online global donation and fundraising platform, to enable more National Societies to raise funds online. The Dominica Red Cross used the platform as part of its emergency response work following Tropical Storm Erika, and raised 10,000 euro through its Facebook page during the first week. National Societies have an online donation facility on their website, Facebook, etc. No cost for setup or maintenance, only a 5 per cent charge on donation. The tool can be set up quickly without any technical expertise. Visit Delegates can visit the ammado stand in the Humanitarian Village to learn more and join the Red Cross and Red Crescent online donation platform.